FOXBORO, Mass. – When Oliver Ames pays a visit, teams know what they are in for. It is going to be a physical matchup and it is critical to not give OA set pieces in the attacking end of the field. Foxboro showed that it is capable of holding its own on the physical side of the game, but then with 16 minutes remaining in a scoreless game the ball went out for a corner. Zoe Chazan played the ball into the middle of the Foxboro penalty area and it skipped off a crowd of players to the edge of the box. Senior right back Dana Lowney was standing alone just outside the 18 and she collected the loose ball and fired a shot just under the bar. That goal was all that would separate the sides in an otherwise even match between former Davenport division rivals. The 1-0 win at Sam Berns Community Field was already the third victory for OA even though the season is less than a week old. 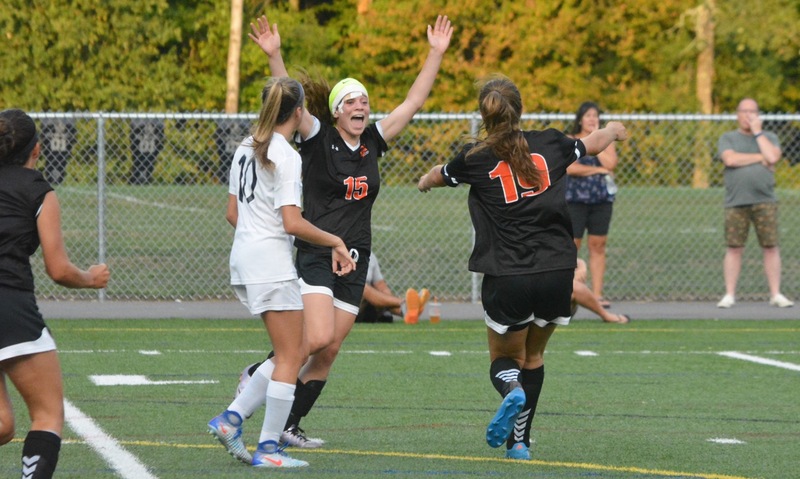 “You’re going to score off headers and the two ‘garbage’ players we have hang at the 18 on both posts, I tell them if you hang there then sometime during the season it’s going to come to you and put it in,” said OA coach Britt Sellmayer. Lowney was wearing a bandage on her head and a black eye from a collision in one of the other games this week. While she explained after the game that it did not hurt, it was a visible representation of the way the game played out. Both teams set up to disrupt their opponent, close down all over the pitch, and never shy away from contact. The aggressiveness of both teams made it difficult to connect passes and for the first half hour the Tigers had the only good scoring opportunities. Francesca Calabraro created the first opening with a run down the right sideline, but her cross was knocked over by Kiana Lozzi inside the six-yard box. Calabraro also had the second chance six minutes later when she pounced on an errant header but she pushed her shot just wide of the post. Foxboro had its first shot on target in the 32nd minute. A throw-in on the near sideline found junior Shaina Abbotton the edge of the OA box. She spun to create a sliver of space and sent a chip that looked destined for the back of the net until junior goalie Regan Benton leapt to get a fingertip on it and keep it out. The Warriors thought they had another chance at a goal two minutes after the break when senior Kristen Bortolotti appeared to be bundled over in the box. Despite the contact, the official waved away appeals from the Foxboro bench and pointed for a goal kick. Although she did not get the call, Bortolotti was Foxboro’s best attacker in the game. She dropped deep into the midfield and ran at the OA defense time and again and twice her movement opened up chances for Riley Collins coming off the wing, but neither led to a goal. Both teams were focused on limiting the top attackers, so Calabraro and Foxboro’s Lily Sykes struggled to make an impact on the game. The Tigers back four (Lowney, Chazan, Emily Freeman, and Emily Short) and the Foxboro back line (Devon Mollica, Lauren Flahive, Olivia Dantona, and Alex Stamatos) kept everything in front and bottled up both ends of the pitch. With 16 minutes to play, a long shot was tipped aside by Foxboro goalie Hallie Canfield. 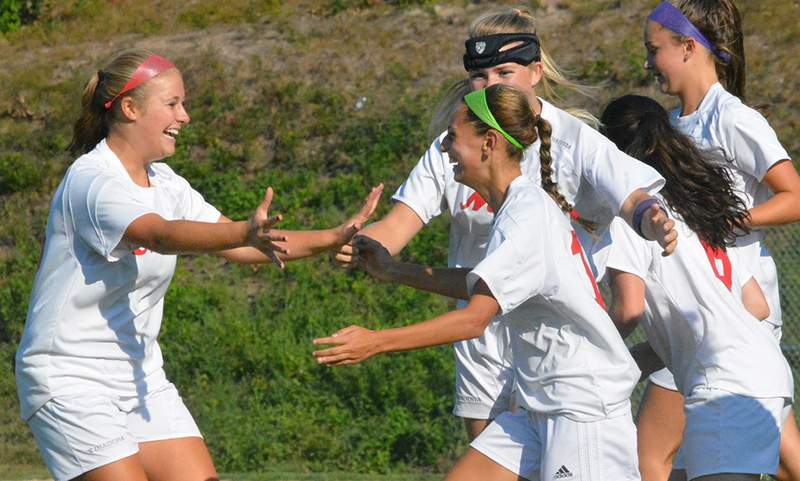 The Tigers got their second of three corners and Lowney made it count. It was the second late goal allowed in as many games by the Warriors, but Lamothe-Vaughn left with a good feeling about how her team played. The game had been moved up because of a scheduling conflict later in the season, so OA played on back-to-back days and three times in four days. The Tigers came through the tough stretch with a perfect six points out of six. Oliver Ames will host Sharon on Monday, while Foxboro will travel to King Philip looking for its first win.